Villa à Worthing, Barbade (tarifs spéciaux pour la saison estivale, voir la liste des tarifs). Charmant quartier résidentiel à 10 mn à pieds de la célèbre plage de Rockley. Villa de 3 chambres et 2 salles de bain avec piscine privée et grand patio couvert avec bar. Située dans un quartier résidentiel, proche à pieds de 2 superbes plages de sable rose, du golf, du tennis etc. À 15 mn de l'aéroport et à 15 mn de Bridgetown. Salle de bain principale : douche, meuble vasque, bidet et toilettes. Salle de bain 2 : douche, toilettes et double vasque. Cuisinière, réfrigérateur avec distributeur de glaçons, micro-ondes, lave-vaisselle et robinet purificateur d'eau par osmose inverse. Lave-linge et sèche-linge hors de la cuisine. Barbecue au gaz LPG dans le patio. not too far of a walk to the beach and restaurants, as well as supermarket (about 15 min walk). was on a very noisy street, dogs barking all day and night long, was quite difficult to sleep. that and the beds were very uncomfortable. house had everything you needed, lots of towels, outdoor furniture, pool, boogie boards. wish that the host would supply toilet paper, not exactly something I like to worry about while I am on vacation. we were not pleased with the cleaning service, she was at the place all afternoon and it still wasn't clean when she left, our sheets were dirty and had hair on them, and the towels weren't washed. she talked on the house phone the entire time she was there and we almost missed our tour because our driver couldn't get through to us on the phone. also not impressed at all with the check out system, owner claimed that we took a pillow and lost a set of keys which was not the case and we never got our deposit back and never heard back from him again on the matter. would not return. Thank you for your review. I do believe this to be a case of "Sour Grapes" because we did not return your damage deposit. This decision was taken because as you lost a set of keys, we had to get a locksmith to re-key all of the locks to the villa. It seems strange that you should complain about the beds when we have the best available mattresses from the USA on those beds and several of our guests have said how comfortable they were. With regard to our housekeeper/cleaner everyone remarks how efficient and pleasant she is and we think so as well. If as you say, there were lots of towels, why would you say they were not washed? Please remember this is a self catering rental and we have a washer and tumble dryer on site for the guests use. Same for toilet paper, the villa is self catering and we do provide a starter roll in each bathroom on the guests arrival. We have been operating Julielm House as a holiday rental since 2010 and never had a complaint. Here is a review from one of our recent guests which she posted. I stayed here for two weeks in February with my family to celebrate my 50th birthday.The only complaint I have is that I had to leave this lovely villa to come home to a lot of snow!!! I have children ranging from 8 to 23 years old and the villa and position of the villa ticked everyone's boxes. Booking was very easy and communication leading up to the holiday from Micheal was super efficient and we were met at the villa as promised despite landing in the evening. All the bedrooms are huge and the outside space is incredible.The pool is plenty big enough and the kitchen is open plan and better equipped than mine at home and I sell kitchens for a living! !The gas barbecue is a real bonus and became a favourite lunch time treat. The villa has a real Bajan ,colonial feel and the gardens are neat , exotic and give ultimate privacy ., the birds are tame and beautiful to watch. The neighbourhood is very clean and safe and is a five minute gentle stroll to Accra beach.Supermarket 5 minute drive and the great Tiki bar 5 minute walk away. 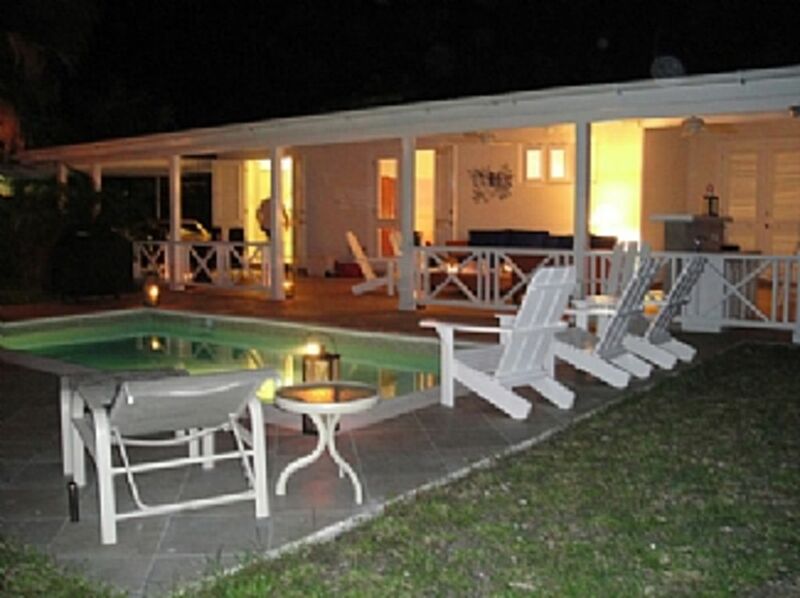 All of my family loved Julielm house and have already requested that I re book ASAP Barbados is a wonderful island with a lot to see , however we did spend a lot of time at the villa Thanks Michael for our lovely stay in your beautiful villa. Booking Notes: All payment to be made in advance. A security deposit of 250.00 UK pounds is mandatory. Minimum rental is one week. Changeover Day: Please contact owner. Our house managers will meet you at the villa to let you in and show you around.